After reading The Slight Edge by Jeff Olson last year, I decided to make a change in my reading habits this year. Instead of reading one book at a time, I decided to read two books at once. I split my reading list into two pieces – learning books and recreational books. I decided to read the recreational books at night and the learning books in the morning. As Olson said in The Slight Edge, if you read about 10 pages/day from a learning book, you’ll finish it in a month. 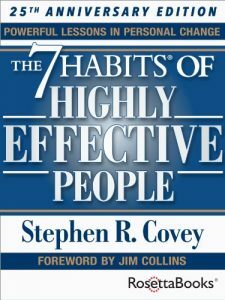 It went well with Psycho-Cybernetics, so I decided to continue the morning reading with 7 Habits of Highly Effective People by Stephen R. Covey. To be honest, I’m not sure how or why I hadn’t read 7 Habits already. I’d heard about it and had it recommended to me numerous times, but I never got around to reading it. I finally decided it was time to push it toward the top of my reading list after seeing this post on the Learning A Day blog that I follow. The blog’s author, Rohan, wrote in that post that 7 Habits was the one book that had deepest impact on how he approached life. With a recommendation like that, I wanted to read it to see if it would be just as inspirational for me. As I ventured in, I’ll admit there was a bit of skepticism. I was afraid that it would be over-hyped and disappoint. 7 Habits is clearly a Must Read book. I put it right up there with Psycho-Cybernetics and The Slight Edge as books that have the ability to alter our personalities. These books can help us become more effective individuals, not just professionally, but in all facets of our life. I’d love to quote the notes that I took in this post, but there wouldn’t be enough room. I found myself constantly highlighting passages and making notes. If I quoted all the notes here, I would practically rewrite the book in this post. It should go without saying that there is a lot of information in the book to digest in one reading. There are many exercises, habits and learnings that I want and need to incorporate into my daily routine. As with Psycho-Cybernetics and The Slight Edge, 7 Habits is a book that I plan to come back to regularly. I have a feeling that there will be additional insights I will capture each time I read it. I also have a strong feeling that I’ll need to revisit it to stay sharp and focused on building, developing, and incorporating the 7 Habits. In addition to adopting it myself, I’m also hoping to get those around me to read and embrace it, especially those in my immediate family. There’s so much information in the book that I wish I had been exposed to earlier in life. I’m convinced that embracing the book will help to make one a better person. It will teach one how to establish balance in their life, discover what it is important, and help one get more out of life and themselves. I’m enjoying my new reading routine. Now that I’ve settled into it, I’m hopeful that I will get to my goal of 25 books read this year. I may even make my stretch goal of 30 book from my 2017 reading list! This entry was posted in Book Reviews, Must Reads and tagged Books, Must Reads on June 18, 2017 by Gregg Borodaty.